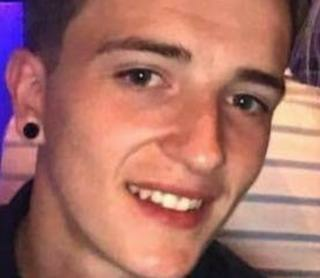 The Public Prosecution Service (PPS) is reviewing a decision not to prosecute a suspect in the case of the death of Jordan McConomy. The 19-year-old died after an assault in the William Street area of Londonderry on 24 September 2017. The following day a man was arrested by police investigating Jordan's death. He was released pending a report to the PPS, who decided not to prosecute. His mother Andreana said the family are "still trying to get justice". The family of Jordan McConomy held a vigil in the city at the weekend. Speaking to BBC Radio Foyle, Andreana McConomy said the family organised the vigil to celebrate Jordan's life. "We wanted to give some light, Jordan was the light of every room he went into." In a statement the PPS said a review was ongoing: "We can confirm we've received a request to review a decision to not prosecute one suspect reported in relation to the tragic death of 19-year-old Jordan McConomy. It would not be appropriate to comment any further at this stage." Mrs McConomy said the family wanted to mark Jordan's 21st birthday in February but found it too difficult to hold the vigil then. "His birthday was just so hard. We just went to the grave and we went to William Street then came back home. "He missed his 20th birthday and now his 21st birthday. He's missed out so much in life. "All I do is cry. I just sit looking at my front door waiting for him to come in." Mrs McConomy said her son had went out to celebrate a friend's 21st birthday party on the night of his death. "He said to me on that Saturday morning that he hated going out in the town. "I told him to go out and enjoy himself. I wish I could take those hours back." Mrs McConomy said the family would never stop seeking justice for Jordan.